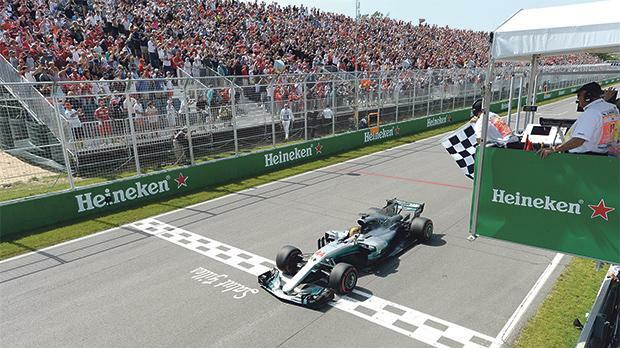 Mercedes’ Lewis Hamilton crosses the finish line to win the Canadian Grand Prix, a fortnight ago. Azerbaijan, a new race last year, is the only grand prix on Formula One’s current calendar that Lewis Hamilton has yet to win and the Briton heads back to Baku determined to deliver this weekend. After a dominant weekend in Canada where he led a Mercedes one-two to regain momentum after a stinging defeat to Ferrari in Monaco, Hamilton is on a high and with the praise of team boss Toto Wolff ringing in his ears. “Lewis is in the best place I have seen him during any of the last five years since he joined the team,” the Austrian said this week. Hamilton will also be keen to banish the memory of a disappointing first visit to the anti-clockwise track running along the shores of the Caspian Sea and around the walls of the medieval old town. “Last year I think I was very quick there; I just didn’t deliver. So the plan is to make sure I deliver,” he said in Montreal after closing the gap between him and Ferrari’s championship leader Sebastian Vettel to 12 points. Hamilton hit the barriers in qualifying in Baku last year, lining up 10th on the grid. He then struggled with engine modes before eventually finishing fifth. His then team-mate and eventual champion Nico Rosberg, who retired at the end of last season, took pole, fastest lap and victory in a race that was designated the European Grand Prix but has since changed name. That means that nobody on the current starting grid is a previous winner in Baku and only Vettel, who was a distant second that day, and Force India’s Mexican Sergio Perez have stood on the podium there. Mercedes struggled in Monaco with getting performance out of the tyres but, after a huge effort at the factory, were back to their best in Montreal. Hamilton will apply the lessons from both to the searing heat of Baku. “You take each experience and you pile them up. What we learned in Monaco will definitely impact Baku. It’s a much longer circuit; I think it’s very smooth, a lot more flat,” he told reporters. Hamilton and Vettel both have three wins from seven races, with champions Mercedes – despite trying to portray themselves as underdogs – ahead 4-3 thanks to Valtteri Bottas’s win in Russia. Bottas clocked the highest ever recorded speed in a Formula One session during qualifying in Baku last year with Williams, hitting 373 kph on the longest straight of any race on the calendar. Vettel showed all his mettle in Canada, however, when he started on the front row, dropped to last and came back through the field to fourth with a fighting display that earned him the Driver of the Day award. “I wanted to get a trophy. I didn’t get one,” he said after his first non-podium finish of the year. He should resolve that on Sunday. Behind the leaders, Red Bull’s Australian Daniel Ricciardo will be gunning for a fourth successive podium appearance while Force India pair Perez and French youngster Esteban Ocon aim for more solid points. 1. Vettel 141; 2. Hamilton 129; 3. Bottas 93; 4. Raikkonen 73; 5. Ricciardo 67; 6. Verstappen 45; 7. Perez 44; 8. Ocon 27; 9. Sainz 25; 10. Massa 20; 11. Hulkenberg 18; 12. Grosjean 10; 13. Magnussen 5; 14. Wehrlein 4; 15. Kvyat 4; 16. Stroll 2. Mercedes 22; 2. Ferrari 214; 3. Red Bull 112; 4. Force India 71; 5. Toro Rosso 29; 6. Williams 22; 7. Renault 18; 8. Haas 15; 9. Sauber 4.